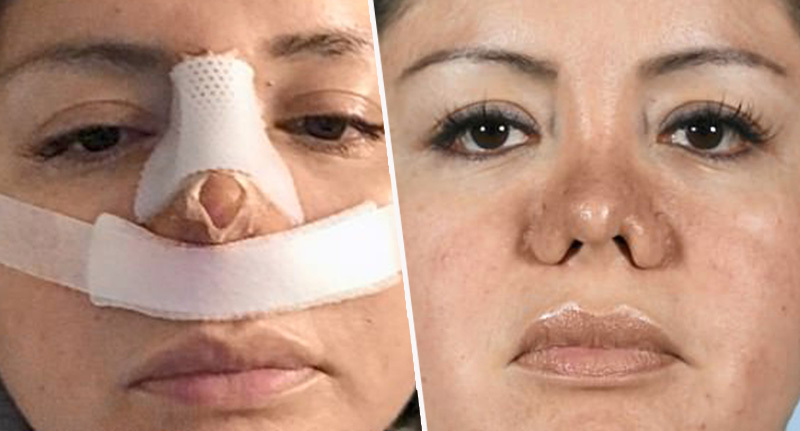 A woman who went into surgery for liposuction and ‘woke up with a new nose’ has told the tale of her terrifying ordeal at the hands of a Peruvian plastic surgeon. The woman, who was only identified by her first name Mariela, suffered an unauthorised surgical alteration to her nose without her consent when she was just 19 years old, which left her with severely damaged nasal passages. Shockingly, she recalled on E! Entertainment’s show Botched, the doctor responsible told the unwilling plastic surgery patient he’d done her ‘a favour’. Mariela enlisted the help of TV surgeons and Botched co-stars, Paul Nassif and Terry Dubrow, years after she had the disastrous surgery in Peru at the age of 19. She had gone to a ‘very famous’ surgeon asking for a ‘little liposuction’ after being bullied for her weight at school. Turns out, that was the least of her problems, she said. She explained, ‘I went in for liposuction, and I woke up with a new nose’, adding ‘This is what I’m left with’. Growing up was hard. I was always a little chubby. I was bullied in school for that. I met with the doctor the day after I arrived and it was a very famous doctor. When I talked to him and I explained what I wanted, he said it was really easy and he could do it the next day. However, the routine surgery turned into a nightmare when Mariela woke up and realised the surgeon had performed an unauthorised rhinoplasty as well without her consent. The doctor assured her that although her nose was ‘swollen’ ‘it will look great’. Instead, Mariela, who is now 41, has been left with severe nasal passage damage for half her life. Not to mention a change to the landscape of her face which she never asked for. When I woke up, I had a cast over my nose. Right after the surgery, I saw the doctor and he said he did it as a ‘favour’. I was pissed. I had absolutely no issues with my nose before the surgery. It was the nose I was born with and I liked it. When the bandages came off, what I saw horrified me. We never saw the doctor who operated on me again. ‘Botched’ continues to air on E! Entertainment every Wednesday and viewers in the UK can catch up on ITVBe.